Publisher: Wahl Institute, Chicago, 1937. Reprint, 2014. Soft Cover, 509 pages, 5.5 x 9.0. With the repeal of National Prohibition in 1933, the Wahl Institute in Chicago sprang to life. Chemist Robert Wahl, along with son Arnold Spencer Wahl, resumed the in-depth study of brewing science for which the Institute had become famous before Prohibition. 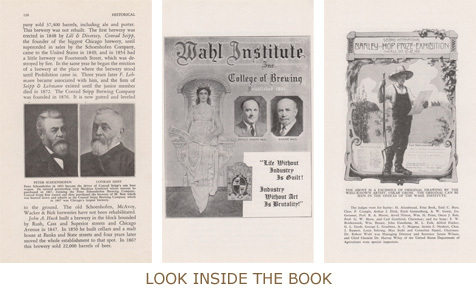 In 1937, the Wahls published this book, the first of what was intended to be a 4-volume set designed to educate a new generation of American brewmasters. The Wahls believed that history was critical to a full understanding of beer. So, the topics of modern brewing are presented within a strong historical context, aided by more than 60 illustrations. Intermingled with those discussions are many of the elder Wahl's personal recollections of the pre-Prohibition heyday of brewing -- giving a rare first-person account of the history of American beer styles, ingredients, brewing methods, and more. Although America was one of the last nations to commence widespread brewing operations, the art and practice has advanced in this country to a production, skill, and science equal to none. And all within a few hundred years! The need for an authoritative and up to date treatise on brewing in the United States has become acute. There have of course been a wealth of brewing books published. Technical libraries are crammed with them, written in many tongues. At the turn of this century one of the authors of this work wrote and published under his name and that of his business partner, the American Handy Book of the Brewing, Malting and Auxiliary Trades, which became the recognized reference in all technical brewing matters. That compendium sufficed up until the time of that most notorious of all sociological experiments in the whole universal record of misguided reform -- Prohibition. But when brewing operations commenced again in 1933, a revolutionized industry was a reality; for modern science and chemists, engineers, and high pressure advertising almost immediately brought the manufacture of beer to a position of commercial comparison with even the gigantic industrial giants of steel and automobiles. Too many new discoveries from recent researches have been made for even the most alert brewer to keep his hands upon them all. There was indeed a shouting, begging, pleading, crying need and demand for a new, all-embracing, accurate and masterful encyclopedia on modern brewing in America! The directors of the Wahl Institute of Brewing Technology, Dr. Robert Wahl and Arnold Spencer Wahl, heard the call immediately that beer came back, and no sooner had its echo resounded than they commenced the Herculean task of preparing, writing, and publishing the most ambitious literary work on Beer, Brewing, and Malting ever presented in print. Such is the plan and the purpose of this work and so has it been conceived and created. 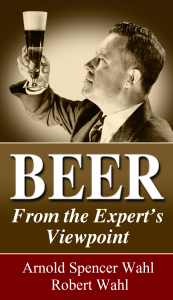 This first volume of four -- Beer From The Expert's Viewpoint -- is like Act One in a Four Act Drama of Beer. Supreme Court Decision Ends F.A.C.A.